Ladies and gentlemen, we have a new artist, mpMann, taking over the art on the main site here. 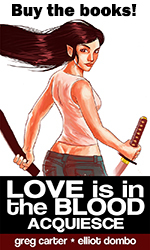 S. Zero will continue a more action-oriented version of the story over at Love is in the Blood Adventures (still under sonstruction). The two timelines start out the same but will soon start veering apart. 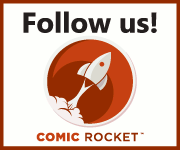 We will be posting a new page every weekday next week and then start our Won-Wed-Fri update schedule the week after that. Also, there is the Love is in the Blood: Acquiesce light novel to read as well. So why did we start where we started? We’ve taken down several pages, and replaced them with my art. Greg suggested starting the entire chapter over so that the look would be more consistent. But I was hesitant about redoing those dream/memory pages of Laila’s birth. Why? First off because I thought they were really excellent, some of the finest work in the whole series in my estimation. I thought it a shame to lose them. Secondly, because I was just getting my feet wet, and I wanted to get rolling with a scene that required less invention. But jumping in at the middle of a scene seemed a little abrupt as well. Laila and Kimmy in a conversation felt right to me. As I told Greg, I like conversation scenes, I like making them visually interesting, and I’m far more interested in the romance aspect of this than the action/violence. That said, we’ve got some action scenes coming up I’m pretty pleased with. Its all choreography. So we begin with a single panel of Laila waking up. While a visual change between the “dream” and waking isn’t planned as a regular device, it nevertheless makes a reasonable.place to make the change and allows me to begin with a comfortable conversation between lovers. HaRAR !!! HARAR !!!! Nice to have you Marvin Mann !!!! But does this mean we will have to wait several months for the Kimmy to let Laila bite her and the consequences of that step? ? Our regular schedule will be 3x per week. with a special 5x first week. Enjoy! ok…so you´re dating up again, which is of the good. taking down a few pages of your inbetween-artist to make the whole thing look more fluid makes sense, i guess, but the new style? not my cup of blood, sorry. nevertheless, i´m sticking around for the plot, and hopefully i´ll get used to it.